Henrietta Hart was born Nov. 22, 1831 in Baden Wurttemburg, Germany and died May 13, 1905 in Taylor Co., Iowa. 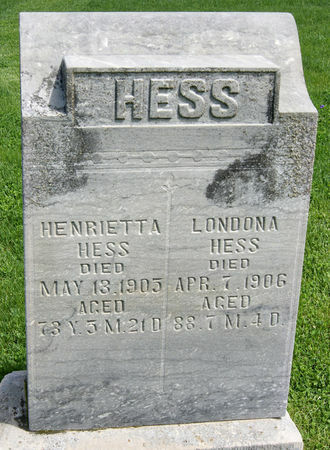 She married Londona Hess in 1851. He was born Nov. 3, 1817 in Germany and died April 7, 1906 in Adams Co., Iowa. Searching for LONDONA HESS in Taylor County Iowa?